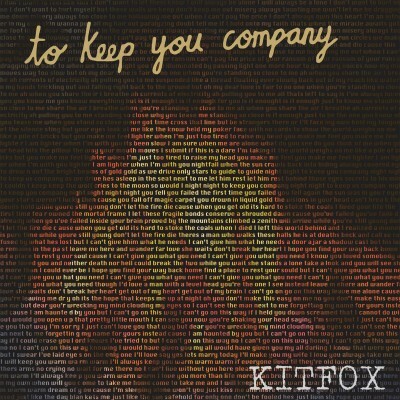 Kitfox are not your ordinary local band. The Provo-based foursome—vocalist Emilee Holgate, guitarist Devon Smith, bassist Conor Flynn and percussionist Nate Dukatz—redefine small-town talent with To Keep You Company, an album as saturnine as it is comforting. Leaving their cutesy folk-pop beginnings in the dust, the band instead uses the LP to implement a hundred new sounds, thus establishing a new one all their own. The attention is not for naught: To Keep You Company is gorgeous. Unforeseen melodies from wholesome-as-hell Holgate pair spectrally with the swelling orchestration; her voice, purer than a lingering Dolores O’Riordan, marries Smith’s consummately. Sundry influences speckle the album—a touch of First Aid Kit on the evocative “Runaway,” a trace of Coldplay on “Ivory”—as well as sundry sounds, but beneath the synths dwell abiding, traditional songs that could stand on their own were the electricity to blow out. When you listen to their ambient folk, you won’t feel alone.